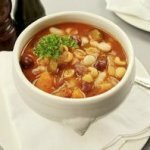 This Italian Fish Soup Recipe is filling and wholesome, quick and easy to make and will satisfy even the most demanding seafood lovers. It needs only 15 minutes of cooking and 10 minutes of preparation time. 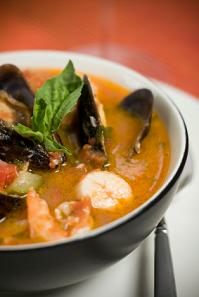 Try our Italian Fish and Seafood Soup Recipe - it is a truly delicious soup for any occasion. There are 294 calories and 12g of net carbs per serving. Recipe Nutritional Profile: Diabetes Appropriate, High Fiber, Heart Healthy, Healthy Weight, High Potassium, Low Saturated Fat, Low Calorie, Low Carb, Low GI, Good Source of Vitamin A, Vitamin B-12, Vitamin B-6, Vitamin C, Iron, Magnesium, Manganese, Niacin and Phosphorus. 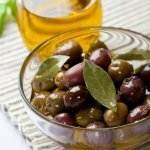 Heat the oil in a large saucepan. Add the leek, celery, fennel, garlic and chilli. Cook over a medium heat until the vegetables are soft and beginning to color. Stir in 1.1 liters (2 pints) of boiling water and add the wine. Bring to the boil, and then simmer the soup, covered for 5 min. Add the fish, tomato and thyme to the soup; continue to simmer gently until the fish is cooked. Add the prawns and simmer for 1 min. Add all the mussels, as soon as the mussels have opened (discard the mussels that have not opened), season the soup and dish up into warm bowls.